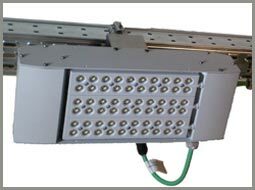 Light Kinetics distributes the BetaLED (also known as RUUD LED) range of LED Tunnel Lighting solutions. They are manufactured in the USA and Europe and are the largest manufacturers in the world of LED street and area lighting. The BetaLED range offers the worlds first genuine energy efficient reliable alternative to existing HID street light solutions. The solutions offered offer an enhanced light output through a significantly more regular uniformity and more realistic and comfortable light colours. Further, due to the precise light shadow of our LED tunnel lights, lighting designers are able to more easily design optimum pole spacing’s and in most cases reduce the number of lights per linear kilometre over traditional HID offerings. 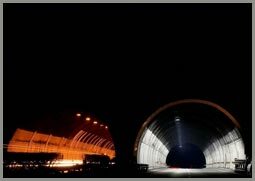 Additionally our LED tunnel light solutions offer a significantly reduced degree of glare, due to their sharp light beam cut-off, significantly reducing light pollution. Of course the net effect of a correctly designed tunnel lighting solution, using Light Kinetics LED street light products, are energy savings of upto 50-80% over existing HID solutions. Combined with a 10+ year operational life at 24 hours daily usage and a zero planned maintenance over this period, this translates into MAJOR savings to municipalities, measured in millions of Dollars or Rands over the life time of the luminaires!. Elimination of planned maintenance for tunnels and under or overpasses translates into the elimination of a major traditional nightmare for municipalities requiring traffic stoppage and risk of injury to maintenance crews. A key advantage of the BetaLED range is that it is modularly configurable from SABS 098 Category B3 Urban to Category A1 highway applications and everything in-between. The modular light-Bar or Light-Module technology allows us to configure varying degrees of light intensity and the wide choice of optics allows us to configure the luminaires to varying pole spacing's and road widths. The BetaLED range offers the most advanced thermal management available today on LED outdoor luminaires, allowing to offer the industries best product warranties and expected product field life. A full suite of independently verified photometric data is available for all our luminaires. Please drop us an email to receive this data.